When you think of legendary rock bands, a few immediately come to mind - one of which is Def Leppard. In the late eighties, Def Leppard was all-the-talk after two of their albums, 1983's Pyromania and 1987's Hysteria went diamond-certified, putting them on a very short list with only four other artists who were able to achieve such a huge milestone. They shook arenas with their bubblegum metal hits and dominated the charts for years. And here we are, 30 years after "Pour Some Sugar On Me" was released into the world and Def Leppard is still ridin' high, making music and touring. Their 2015 self-titled album debuted at No. 1 on the Top Rock Albums, Top Hard Rock Albums and Top Independent Albums charts - so, yes, they still got it. It's been 40 years since the band formed and as Def Leppard's guitarist, Phil Collen says "we're better now" and we absolutely agree. 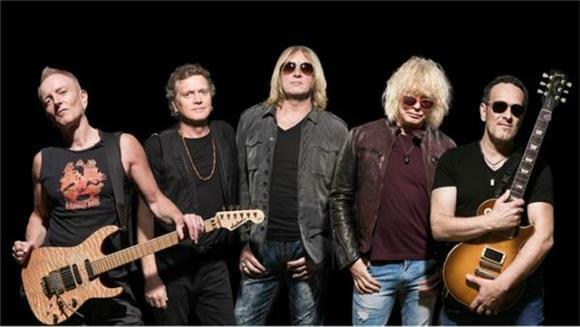 Def Leppard's recent releases demonstrate that the British rockers can still whip up some high-rate melodic rock songs. I caught up with Phil Collen when he was in Sacramento helping Tesla finish their upcoming album. Tesla and Poison will be joining Def Leppard on an extensive 2017 North American tour - which starts in April - and on February 10th, the band will release their new DVD, And There Will Be a Next Time - Live From Detroit. Mandi Dudek: How's it going? Phil Collen: It's great, thanks! MD: Can you tell me about the new DVD that's coming out? PC: Absolutely! That show was the best I've ever seen it. And we actually thought we wanted to capture that. You know, we've done Hysteria live in Vegas but we wanted to get the full scope of a big production and we haven't done something like that since the 80s so it was kind of a revisit. That's really why we did it. MD: How come you chose Detroit as the show to film for the DVD? PC: Detroit Rock City - it has a reputation. It's always been brilliant to us and the audience is fantastic, you know. And it's one of the first shows to sell out. So it was an absolute no-brainer. MD: That's incredible. And it's called And There Will Be a Next Time, where'd that title come from? PC: It's because Joe [Elliot] always says that every night. He says "We'll see you next time and there will be a next time!" MD: It's been awhile since Def Leppard's live performance has turned into DVD. Did you guys want to have an updated version since it's been a couple of decades to showcase how the band performs now and how you still got it? PC: Absolutely. I think the other thing is, you know, I actually think were a way better band now than we were in the other ones. We just wanted show our progress. MD: Do you have a favorite song to perform out of all the songs Def Leppard has created over the past decades? PC: Yeah, I think you always love playing your new stuff. It's novelty so you always want to get the new stuff off. What's really interesting when you play new songs is there's a real slow reaction to it because when you play "Pour Some Sugar On Me" and stuff like that, people go nuts! So it takes awhile for these new songs. So with "Let's Go", which is track one of our last album, that started to get a reaction - which was really cool. With the new songs, most artists would prefer to perform those because they're new and fresh and sort of a challenge. MD: Yea, that totally makes sense. When you guys are on stage and look into the crowd now versus in the past, do you notice the age of the fans have a bigger range since you've definitely picked up some younger fans recently? Or what does the crowd look like these days? PC: It's everything. We always say our goal is from 5-55. You want to get right across the board. You never want to be a fad of just screaming girls. We seriously see 5 years to probably 70 years old and everything in between. It's really everything and that's always been the plan. It's a really healthy looking audience. The demographic if you're a classic rock band and it's just old people or if you're a pop group and its just young people - you've got a limited window. I've always thought that I wanted to cross over. Even with genres, as well, our album Hysteria crossed over into lots of different genres. Thriller by Michael Jackson proved he wasn't just an R&B artist, it went all the way through everything. So that's definitely what you want to see in an audience. MD: Right. And when your music does cross over into different genres is exactly how you pick up that wide range of ages in the crowd. MD: What about when you look into the crowd and see a swarm of iPhones recording? Because you've played when technology wasn't even a big thing. PC: Obviously, that technology right there. People used to hold lighters up and now it's cell phones that they hold up. From the 70s to 80s and into the future, if you would've said there'd be no record stores or no bookstores and people are going to have these cell phones, I would've said, "WHAT is a cell phone?" You know? So the whole thing is actually really cool that we still get to do the same thing. It's almost like a parallel universe. But besides that, things haven't really changed that much in the audience. People's reactions are still the same, so that's mission accomplished on our part. MD: So I understand you have another tour coming up with Tesla and Poison, which starts in April, and you're hitting a bunch of cities that you didn't make it to during your 2016 tour. Are there any cities that you're particularly excited to visit for whatever reason? PC: Well, whenever we play Montreal and people ask, "Whats the loudest audience you guy have?" and it's always a toss-up between Montreal and Mexico City. So whenever we play either of those two cities, it's just ... ah, it warms you and it's just so great. We know were always going to get a crazy, amazing audience. On this tour, were hitting a lot of cities that we didn't hit before and got a little neglected a little bit. Instead of just hitting the same old, same old, same old, were going a bit deeper on this one. So it'll be a lot of fun. MD: And you've toured before with both Tesla and Poison, right? PC: Yeah, I'm actually with Tesla right now in Sacramento - where they live - finishing up their new album, which I'm actually producing. So I'm ultra excited about that. I'm really super excited about that. Obviously then were going to be on tour with them and I think I spend more time with Tesla than I do with Def Leppard [laughs]. It's kind of cool, we've known each other for 30 years so it's really cool to be on tour again. MD: And when did you tour with Poison? PC: We've done two or three tours with Poison. We've known them since the 80s and I'm really looking forward to these three bands. We're pretty much one big, happy family. It's all you want on tour. It makes touring an event, not just for the people but for all of us to enjoy it as well. C.C. Deville [of Poison] is brilliant. He's so much fun and he's funny - he should be a stand-up comedian on the side. I think with all the different energy of all these characters, it'll be blast. MD: You guys are going to have so much fun. Plus, it's the first time Poison has played a live performance together in years. PC: Yeah, since the last time they toured with us, I think! I think that was 2012. So yeah, it's going to be fun. MD: You're going to get an awesome crowd for this tour. So, besides the "normal" injuries that rock band members face - like vocal injuries, exhaustion, minor sickness... stuff like that - how do you stay so healthy to continue doing all these tours after all the years? PC: If you want to keep going on tour, you HAVE to take care of yourself. Everyone does different things but I'm a non-smoking, non-drinking vegan. That really, really helps. And I work out all the time. So that also helps. I feel better at 59 than I did at 25. MD: I definitely need to take that advice! Ok, last question. Do you have any advice for the new rock bands out there to make it for four decades and beyond the way Def Leppard has? PC: Yeah, absolutely! First, don't expect a reward. The reward is your artistic expression. If you're really into what you do, you get a reward for that. The other thing is - I think people work hard enough for it. We work our asses off on every level, whether it's in the studio or at rehearsals. Most bands and most artists aren't prepared to put that work in. The main advice would be that you just have to work a lot harder. What you think is hard work normally isn't and you could always do more. That's the thing. Everything else is secondary. If you don't get on with someone, make sure you do! Just work harder. You can pre-order And There Will Be a Next Time here.